We are setting up a referral program for our site. The person who is doing the referring (the referrer) fills out a form, a coupon code is generated via the API, and the code is sent as an email to the referral. If the referral code is redeemed, the referrer gets a coupon code as well. Both coupons are "buy $x or more, get $y off" discounts. The referral codes are not stackable, but my boss wants the referrer to be able to use as many codes as they wish. Even if the referrer walks away with free stuff, we will have made more than enough off the referrals. 2. I don't see an (obvious) way to limit the number of coupon codes used per transaction. I can limit how many times all coupons can be used, or how many times a single code can be used, but if I allow multiple codes to be used in a single transaction, there's no limit on how many of those codes they can use. I understand that this isn't exactly the most common usage of coupons, but any help is appreciated. Thanks for posting and providing a detailed overview of what you're looking to achieve! That's definitely an interesting use case. While we do have a limit on how many times a single code can be used, we don't have a limit of how many codes a user can attach to a given transaction. That said - you mentioned that the order total went into the negative - is that right? If so, could I confirm with you where you're seeing that and what steps we can take to replicate? The order total should only ever go as low as $0 - if you're seeing negative totals that's definitely something we'll want to fix. 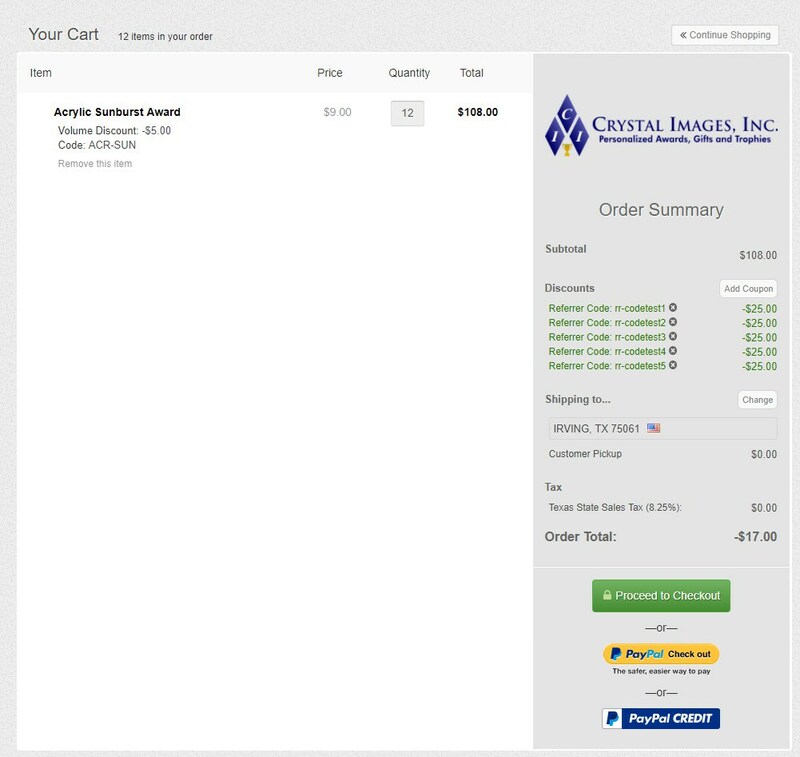 Here is a screenshot of the cart. There are five coupons codes applied - they all are set as $25 off with a purchase of $100 or more. They are stackable with each other, so if you applied four coupons and purchased $100 or more, your order would be free - which is fine. Once you add the fifth coupon, though, it allows negative values in the cart and in checkout. Thanks for the screenshot - we'll definitely want to look closer at this as it shouldn't be showing a negative amount there. I've tried to replicate on both my own test store and yours - but the total only ever goes as low as $0 for me. Would it be possible for you to whisper me a link the product to add, and the steps you're taking to end up with that result please? To whisper, when replying check the "whisper" checkbox and enter my forum username in the text input that appears. After playing around with other product combinations to see if it is a product-specific error, I was also unable to replicate the negative number, even with the same product -- until I put in a zip code. Once I put in a zip, even if I didn't choose a shipping option, it shows a negative number. Ah thanks for confirming that - I can replicate that happening now too. We'll look into what's allowing the negative totals there and follow-up once it's fixed. Do you have any update for this issue? Thanks again for looking into this, we appreciate yall! Thanks for checking in - unfortunately we don't have a fix ready just yet - but we'll update you as soon as we're able to make progress there. Just an FYI - this happened to me today where I was using 2 x $25 coupon codes to give a customer a free product worth $42. In the checkout, it showed a balance of -$8 and I was worried that they would get a credit charge to their Amex for $8 but it went through as a $0 order and the receipt was correct with a $0 cost and $42 discount. @Sparky thanks for letting us know. I'll update the ticket with that additional information specific to your experience.